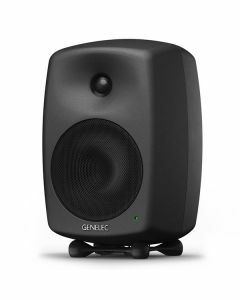 The Genelec 8040BPM is a professional two-way nearfield active studio monitor with a 6.5" woofer and a 3/4" tweeter. With a frequency response of 41Hz-25kHz and a 105dB max SPL, couples with dual 90Watt amplifiers, the 8040BPM is as powerful as it is precise and detailed. As unusually good-looking as it is sonically imposing, the 8040B makes good use of Genelec’s patented rounded edges and colour-free, accurate reproduction of the rigid all-aluminium Minimum Diffraction Enclosure (MDE). Every element of this monitor is sculpted to polish your listening experience. Maxing out at 105dB, the 8040B has a 41Hz – 25kHz (-6dB) frequency response. Its 6 ½” woofer and ¾” tweeter are both 90W and the monitor weighs 9.4kg. Genelec Intelligent Signal Sensing (ISS) circuitry is also capable of identifying when your system is no longer in use, placing it into an environmentally friendly, power-saving standby mode. Genelec engineer each Classic Series subwoofer to deliver expressive and dynamic low frequency reproduction, thanks to their design finding its foundation in the Laminar Spiral Enclosure (LSE) principle. Meanwhile, at the high end, their monitors provide an unwaveringly flat frequency response, from the removal of diffractions and control of the sound directivity, courtesy of the Directivity Control Waveguide (DCW) and the perfected flow of the reflex tube design. Each legendary two-way 8040B monitor is accommodated in an MDE. Developed for performance, this forward-thinking die-cast aluminium design is robust and vibration-free, its structure guarantees diffraction-free sound reproduction even at the highest output levels. Equally, the two way models of the M Series maintain the highest standards of environmental awareness, thanks to Genelec’s Natural Composite Enclosure (NCE) which utilises an injection-mouldable wood material, but also dispense superior acoustic damping and rigidity. Other highlights comprise dedicated amplifiers for each driver, manual room response control to aid compensation for acoustic influences, and on-board overload protection. The result of years of research and refinement, the Genelec Classic Series models are the tools to which audio experts turn for truly reliable monitoring.